The Grander water revitalization is based on the principle of information transmission and provides water naturally high, stable and biologically valuable quality. Water has a changeable inner structure. The basic idea of ​​the Grander water revitalization is to strengthen by improving the water structure, the self-cleaning and resistance of the water, thereby creating a stable immune system in the water. Water naturally has very special characteristics, but which can only develop and thrive when it is natural and spared from stressful environmental influences. These circumstances make on tap water often can not. Although "normal"
tap water gushes fresh and valuable from the source, long transport routes, pressure in lines, mobile phone, radio and radio waves act but a negative effect on the water a - it loses its vitality and relaxed. 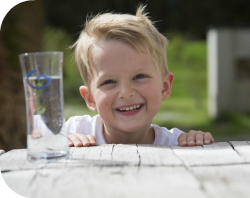 Grander revitalized tap water again, strengthens it and makes it back to what it was originally once: powerful, energetic and of course!